Ten pounds doesn't buy a lot these days.. yes, our parents will tell us that when they where younger, a tenner could pay for a night out at the cinema for two, a slap-up-meal and a cab home or something. Well, one thing that ten pounds will buy you these days in the Sagem my150X on Orange pay-as-you-go. If you're obsessive about phones, or perhaps you've taken it out of the box to look at and can't remember which order it all goes back in, you can have a look at the unboxing pictures. 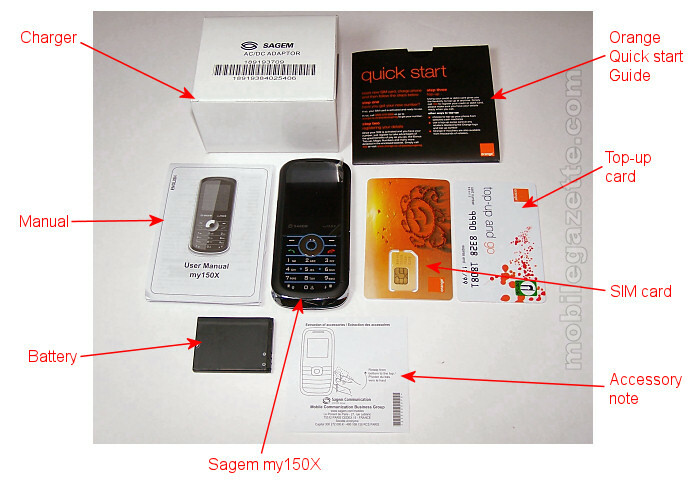 It's a pretty straightforward device - the Sagem my150X comes with the bare basics of a charger, battery, manual and the SIM card, top-up card and an Orange quick start guide. There's also a piece of paper instructing you how to remove the charger or an accessory from the concealed socket. We didn't have an Orange SIM to plug into the my150X, so the first thing to do was register the SIM card. In the UK, you can do this by visiting orange.co.uk/payasyougoreg or by calling 0800 0790 0006. This was the first hurdle, and in order to avoid having to talk to some awful call centre somewhere, we tried to register it online..
We tried for several days and could never get past the "Unfortunately there has been a problem with your request. A fault has been reported." Message. This did not bode well. Eventually, we gave up on Orange's web site and called the number. This was a pretty simple automated system that got the SIM card activated in about three minutes. Encouraged by this, we then tried to top-up the phone which also proved impossible only, and only a very tedious and strained call to some overseas call centre eventually managed to get it topped up. Eventually, we got the my150X working and the first thing that strikes you when you power it on is the screen. Sagem call this display technology NeoN - and it's a very bright, high-contrast monochrome display. There's a mix of a matrix display and some predefined symbols, giving it a very unusual look. The main matrix part of the screen is quite low resolution, but it is very easy to read. It is a very elegant looking phone - the Sagem my150X is a very glossy device with a slightly soft-touch rear panel. The metallic edging gives it a very smart appearance, and the overall design is very tidy. The flat keypad will not be to everyone's taste, but it does have a very slight ridging to guide fingers to the right place. At just 67 grams and just 10mm thick, this is a very slim and lightweight device too. The phone illuminates nicely when in use - it certainly doesn't look like a cheap phone. The phone's functions are fairly basic but practical - there's a loudspeaker function, alarm clock, calculator and SMS messaging, and that's really about it. The audio quality isn't great, but it's certainly adequate. Users can choose between a variety of predefined ringtones and messaging tones, all of which are quite loud and jolly. The interface is really simple to use.. you won't need to refer to the manual for anything. The menus and interface are attractively laid out given the limitations of the display. There are a few faults - the whole phone is a real fingerprint magnet. The highly polished front surface shows prints and greasy marks easily, as does the plastic panel on the back. In fact, the back cover feels a little flimsy, but worst of all is the cover for the power charger or accessory, that's really flimsy and looks very easy to break off. It's hardly a feature-rich phone either.. remember that it has a monochrome screen, no camera, no Bluetooth, no MP3 player and no web browser. It doesn't have Java either, so you can't download games, in fact there are no built-in games at all. Remember though that this is one of the cheapest phones on the market, but for the money you do get a very elegant, easy-to-use screen with a unique display which is certain to attract some attention. It certainly gives more "wows per pound" than the iPhone. So, if you're looking for a very low cost but elegant phone as a Christmas gift, then the Sagem my150X is worth considering. This is a highly attractive and well thought out device, and the biggest drawback that we can see is the pain of having to deal with Orange. 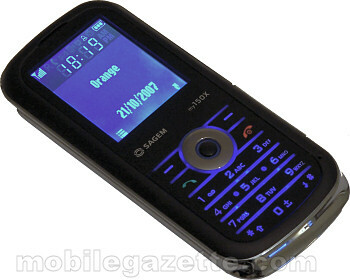 The Sagem my150X is available from Amazon UK, Amazon Deutschland, or branches of ASDA in the UK.